Media attention is directed to some minor ethnic violence in Myanmar, the former Burma. The story in the “western” press is of Muslim Rohingya unfairly vilified, chased out and killed by Buddhist mobs and the army in the state of Rakhine near the border to Bangladesh. The “liberal human interventionists” like Human Rights Watch are united with Islamists like Turkey’s President Erdogan in loudly lamenting the plight of the Rohingya. That curious alliance also occurred during the wars on Libya and Syria. It is by now a warning sign. Could there be more behind this than some local conflict in Myanmar? Is someone stocking a fire? Rakhine plays an important part in [the Chinese One Belt One Road Initiative] OBOR, as it is an exit to Indian Ocean and the location of planned billion-dollar Chinese projects—a planned economic zone on Ramree Island, and the Kyaukphyu deep-sea port, which has oil and natural gas pipelines linked with Yunnan Province’s Kunming. Pipelines from the western coast of Myanmar eastwards to China allow hydrocarbon imports from the Persian Gulf to China while avoiding the bottleneck of the Strait of Malacca and disputed parts of the South China Sea. It is in “Western interest” to hinder China’s projects in Myanmar. Inciting Jihad in Rakhine could help to achieve that. There is historic precedence for such a proxy war in Burma. During World War II British imperial forces incited the Rohingya Muslim in Rakhine to fight Burmese nationalist Buddhists allied with Japanese imperialists. The Rohingya immigrated to the northern parts of Arakan, today’s Rakhine state of Myanmar, since the 16th century. A large wave came under British imperial occupation some hundred years ago. Illegal immigration from Bangladesh continued over the last decades. In total about 1.1 million of Muslim Rohingya live in Myanmar. The birthrate of the Rohingya is said to be higher than that of the local Arakanese Buddhists. These feel under pressure in their own land. While these populations are mixed in some towns there are many hamlets that belong 100% to either one. There is generally little integration of Rohingya within Myanmar. Most are officially not accepted as citizens. Over the centuries and the last decades there have been several violent episodes between the immigrants and the local people. The last Muslim-Buddhist conflict raged in 2012. Since then a clearly Islamist insurgency was build up in the area. It acts under the name Arakan Rohingya Salvation Army (ARSA) and is led by Ataullah abu Ammar Junjuni, a Jihadist from Pakistan. (ARSA earlier operated under the name Harakah al-Yakin, or Faith Movement.) Ataullah was born into the large Rohingya community of Karachi, Pakistan. He grew up and was educated in Saudi Arabia. He received military training in Pakistan and worked as Wahhabi Imam in Saudi Arabia before he came to Myanmar. He has since brainwashed, hired and trained a local guerrilla army of some 1,000 Takfiris. Rohingya community [in Karachi] is more inclined towards religion and they send their children to madressahs. It is a major reason that many religious parties, especially the Ahle Sunnat Wal Jamaat, the JI and the Jamiat Ulema-i-Islam-Fazl, have their organisational set-up in Burmese neighborhoods. 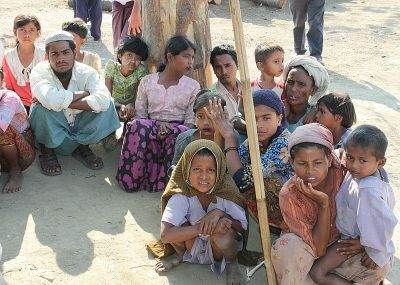 “A number of Rohingya members living in Arakan Abad have lost their relatives in recent attacks by Buddhist mobs in June 2012 in Myanmar,” said Mohammad Fazil, a local JI activist.Rohingyas in Karachi regularly collect donations, Zakat and hides of sacrificial animals and send these to Myanmar and Bangladesh to support the displaced families. “Though not confirmed, there are indications [Ataullah] went to Pakistan and possibly elsewhere, and that he received practical training in modern guerrilla warfare,” the group said. It noted that Ata Ullah was one of 20 Rohingya from Saudi Arabia leading the group’s operations in Rakhine State.Separately, a committee of 20 senior Rohingya emigres oversees the group, which has headquarters in Mecca, the ICG said. The ARSA Jihadists claim to only attack government forces but civilian Arakanese Buddhists have also been ambushed and massacred. Bugghist hamlets were also burned down. The government of Myanmar alleges that Ataullah and his group want to declare an independent Islamic State. In October 2016 his group started to attack police and other government forces in the area. On August 25 this year his group attacked 30 police stations and military outposts and killed some 12 policemen. The army and police responded, as is usual in this conflict, by burning down Rohingya townships suspected of hiding guerrilla forces. To escape the growing violence many local Arakanese Buddhist flee their towns towards the capitol of Rankine. Local Rohingya Muslim flee across the border to Bangladesh. Only the later refugees seem to get international attention. The Myanmar army has ruled the country for decades. Under economic pressure it nominally opened up to the “west” and instituted “democracy”. The darling of the “west” in Myanmar is Daw Aung San Suu Kyi. Her party won the elections and she has a dominant role in the government. But Aung San Suu Kyi is foremost a nationalist and the real power is still held by the generals. The young Aung San learned to wear Japanese traditional clothing, speak the language, and even took a Japanese name. In historian Thant Myint-U’s “The River of Lost Footsteps,” he describes him as “apparently getting swept away in all the fascist euphoria surrounding him,” but notes that his commitment remained to independence for Myanmar. In April 1942, Japanese troops advanced into Rakhine State and reached Maungdaw Township, near the border with what was then British India, and is now Bangladesh. As the British retreated to India, Rakhine became a front line.Local Arakanese Buddhists collaborated with the BIA and Japanese forces but the British recruited area Muslims to counter the Japanese. When the British won against the Japanese Thakin Aung San change sides and negotiated the end of British imperial rule over Burma. He was assassinated in 1947 with the help of British officers. 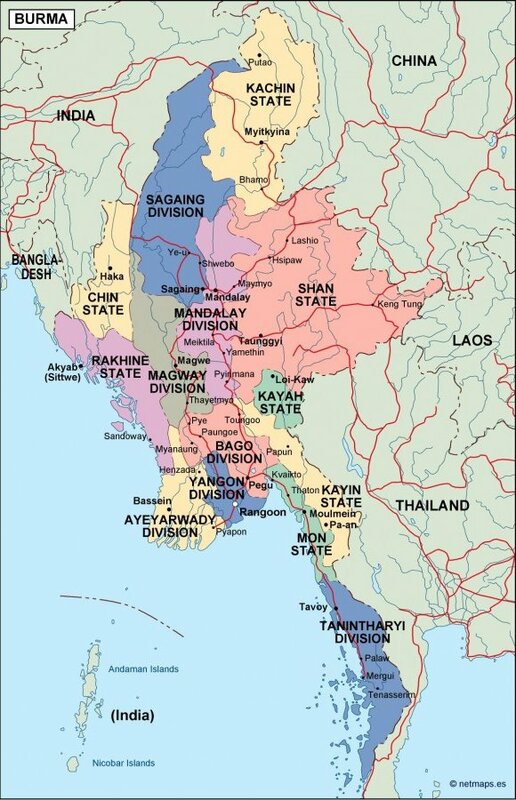 Since then Burma, later renamed to Myanmar, was ruled by ever competing factions of the military. Thakin Aung San’s daughter Aung San Suu Kyi received a British education and was build up for a role in Myanmar. In the 1980s and 90s she quarreled with the military government. She was given a Nobel Peace Prize and was promoted as progressive defender of human rights by the “western” literati. But she, and the National League for Democracy (NLD). she leads, were always the opposite – ultra-right fascists in Buddhist Saffron robes. The hypocrites are now disappointed that she does not speak out in favor of the Rohingya. But doing so would put her on the opposite side her father had famously fought for. It would also put her in opposition to most of the people in Myanmar who have little sympathy for the Rohingya and their Jihadi fight. Moreover – the Chinese OBOR projects are a huge bon for Myanmar and will help with its economic development. The Saudis and Pakistani send guerilla commanders and money to incite the Rohingya to Jihad in Myanmar. This is a historic repeat of the CIA operation against Soviet influence in Afghanistan. But unlike in Afghanistan the people of Myanmar are not Muslim they will surely fight against, not join, any Jihad in their country. The Rohingya are now pawns in the great game and will suffer from it.